Since we moved things have seemed to be none stop, we are more or less stripping everything out of each room and starting a fresh so there is something constantly going on. I was recently contacted by Sanctuary bathrooms to see if wanted to take part in their perfect night in, I jumped at the chance. Our bathroom is currently not how I want it as I want to rip it out and start fresh, but that's going to take a bit of saving up. I have actually spent a bit of time browsing the Sanctuary site for inspiration, I had not heard of them before and their products look brilliant, I am surprised I hadn't heard about them before due to the industry I work in and the fact they are a local family business. If you want to take a look at what Sanctuary bathrooms do for yourself take a look here. As for the perfect relaxing night for me this starts in the bathroom with a nice long soak in the bath. At times this can be a little less relaxing as I will pick out the faults with what we have now, but I can't wait to get it redone. I currently make sure the laptop is set up at the side of the bath as I will either watch a TV show or listen to my music. 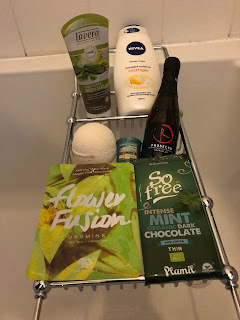 Then I will decide whether that day I fancy a lovely Lush bath bomb or my trusty Radox muscle soak bubble bath, this has always been a favourite as it actually manages to make my leg ache a little less. Once the decision is made I will then apply a face mask, I usually use a Superdrug one however, lately I have been giving sheet masks a try, and so far so good. I have noticed my skin has taken a bit of a turn for the worse especially the tops of my arms, so whilst this is happening I am exfoliating a lot more I will then finish off with the Nivea Shower Cream Gel as it just smells gorgeous and leaves my skin feeling really soft. I am also trying to get into having a candle lit whilst I am in the bath as it just makes the room smell really nice and the little votive ones don't take up much space but do give out a great smell. You just can't go wrong with a nice smelling candle in whatever room you are in and Yankee candle do some of the best ones, I just need to try unpack the rest of the ones I own. Once I am out of the bath I will either head into the games room, to play a bit of whatever game I am on at that point or I will head straight to bed and watch some YouTube or a film. No matter what I do I will end up eating a full bar of chocolate, I am trying my best to be healthier at the moment so I am trying my best to switch to eating dark chocolate, plus I think it tastes a lot nicer. I will also make sure I have a good drink by my side, this could literally be a glass of prosecco, a whisky or a glass of coca cola, depending on what mood I am in, sometimes I will also take this in with me whilst I am in the bath. Then once I start to fall asleep that is it, lights out for a good nights sleep. So there you have it those are some of the ways I create a perfect relaxing night in for myself. Parts may change over time but this is what I try stick to as I have found it really works for me. I just can't wait to get the bathroom done so I can relax perfectly in a space I have created. * I was sent the items in the image above to include in this post, however all thoughts and opinions are my own.